I’m such a twit. I’ve gone and installed this blog system with blatant disregard for actually reading the docs. And now I can’t work out how to make it do half the things I want. Whereas, if I’d just slung up a(nother) Geeklog system, we’d be ticking right along, if not looking quite so crisp and clean. [sigh]. Content management systems are well and good, but sometimes, I want a decent content metamanagement system. Has anyone come across a supplier of snake models or reasonably realistic toy versions? I’m after a sidewinder snake that can be handled for a feely box exhibit. Try Daisy and Toms Deansgate Manchester; I purchased some funky models there recently. What’s scary is that last Monday we had a similar exchange about insects in resin. Any offers for next week? Geek übersite Slashdot has just posted a review of Haruki Murakami’s Wild Sheep Chase and Dance Dance Dance. What is the world coming to? Actually, I’m just checking to see what happens when I upload a graphic, since I’ve not done that yet with MT. But still, if you haven’t read the book, I heartily recommend it. One’s man’s account of a very personal war, against (seemingly) everybody in the Balkans and his own drug addiction. It sounds ghastly, but manages to be strangely compelling, even inspiring. Here’s the Amazon UK link. Testing to see if Moveable Type 2.2.1 installed correctly. If you can see this, I guess it did. One of these days, I may even get around to writing something interesting in this blog. But I wouldn’t count on it. Remind me to give up sooner. While I was suffering some browser death stuff there, fundamentally that gallery system just doesn’t play nicely with my web host. C’est la vie. Meanwhile, I’m wondering if I’m really going to bother blogging like this. Somehow I doubt it. Enjoy it while you can, gentle reader. I’ve been trying to configure an image gallery script on mein host, but without much luck. Gallery looks great, but the setup does some things the server doesn’t allow for security reasons, and trying to work around it has been a bit of a non-starter so far. 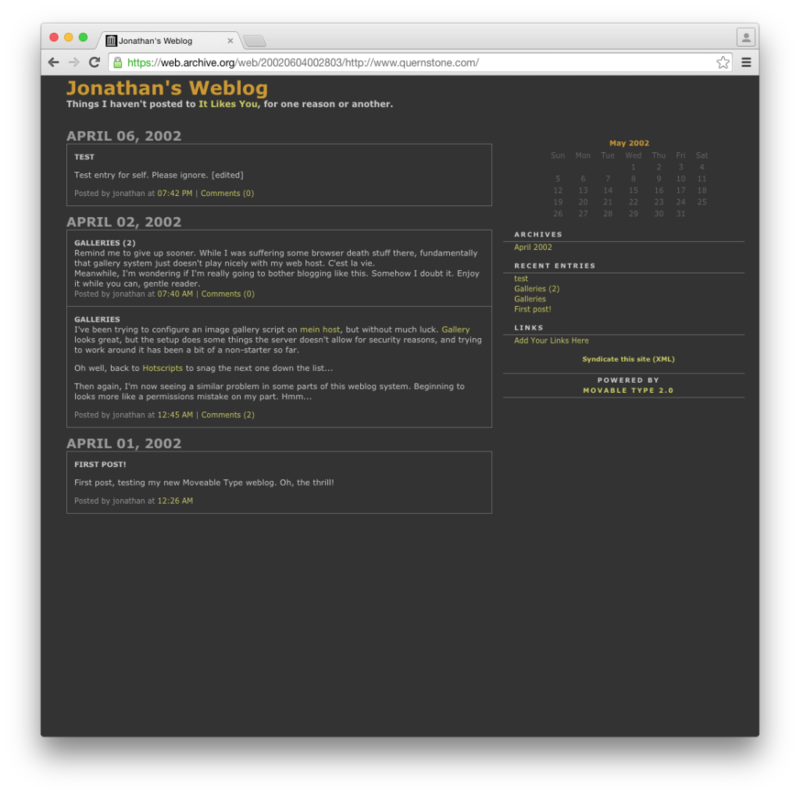 First post, testing my new Moveable Type weblog. Oh, the thrill! Click the image for the Archive.org crawl.